Magnet and choice schools offer the standard required curriculum of general education, as well as distinctive themes or programs, such as science, technology, math or the arts, that attract students to the schools. 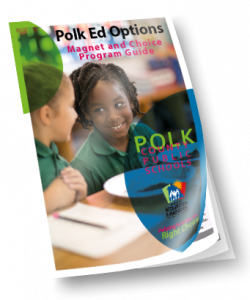 Originally, the sole purpose of magnet was to desegregate schools that were specifically identified in the Polk County desegregation agreement. Choice schools can be created in response to community or school interest. Partial choice schools have a student population comprised of students who are zoned for that school by the address where they live and a group of students who apply for a predetermined number of choice seats. Full choice schools have a student population comprised of students who have applied to the school. This type of school is similar to a magnet school in that all seats at the school are filled through an application process. The key below will help you determine which magnet and/or choice schools are available in your zone. Click on the school name for information. Not sure what zone you’re in? Find out now with our district Zone Finder! View district zone map (PDF). Students who live in the areas zoned for the following schools would attend magnet and choice schools in Zone A. *Tenoroc High School serves students in both Lakeland and Winter Haven. Please check your Magnet Zone on the district’s ZoneFinder to determine which Magnet Zone your child is eligible to apply for. *Tenoroc High School serves students in both Lakeland and Winter Haven. 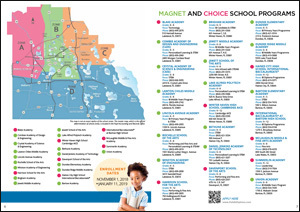 Please check your Magnet Zone on the district’s Zone Finder to determine which Magnet Zone your child is eligible to apply for. Students who live in the areas zoned for the following schools would attend magnet and choice schools in Zone C.
Students who live in the areas zoned for the following schools would attend magnet and choice Schools in Zone D.
How long can my application be on file in the applicant pool? The applicant pool is kept for one school year. If students are not accepted from the pool that year, they must reapply the following open enrollment period. How are students selected from the pool? Students are selected for vacant seats by computerized random selection process. Will my application be assigned a number or placement in the waiting pool? No, no numbers are assigned and there is no designated placement, as all selections are random. I have moved or changed my contact information, what should I do? Notify the Office of Acceleration and Innovation at 863-534-0631 of the change. How often are selections made? As often as vacant seats are reported by the school. Acceptances are done until mid-October. What is the sibling policy for the magnet schools? Incoming kindergartners with a sibling enrolled in the school at the time of open enrollment will receive a priority. Only 50% of the kindergarten class will be reserved for siblings. No other sibling priority is given. How will I be notified of my acceptance? A letter of acceptance with a response card will be mailed to the address provided on the application. After July 1st, email and phone acceptances will be made. Please make sure all contact information is kept updated with the Office of Acceleration and Innovation. If I apply for multiple schools and am accepted into one, will I still be eligible for the other schools? Once you have accepted a seat at one school your application will be removed from all other waiting pools. If your residence address is two or more miles from the school, transportation will be provided if requested. Can I apply for a magnet school outside of my zone? No, your residence address must be in the Magnet Zone for the school you are applying for. Is transportation provided for magnet school students? If the residence address is 2 or more miles from the school, transportation will be provided. Once I received my letter or phone call of acceptance, what is my next step? If you receive a letter of acceptance, you must return the response postcard by the date stamped on the card, and contact the school within 5 days of receipt of the letter. If you receive an email or phone acceptance, you must respond by date on email or voice mail. If I move into another magnet zone after I’ve been accepted, what happens? If you move out of the magnet zone you applied for and you have been accepted, you will have to forfeit the acceptance and apply (when applications are available) for magnet school in your new zone. What happens if my child is retained and the application grade is incorrect and I’ve been accepted for the incorrect grade? If your child is retained and you receive an acceptance for the incorrect grade, you will have to forfeit that seat, and reapply (when applications are available) for the correct grade.